now I see what the future holds "
Pet're is of just over average height and weight, with a sort of softness to him that might have been imparted by a fairly sedentary life but, as it remains even after Turns of harder work as a rider, seems to just be an innate part of him. His legs are a bit short for his height, and he has a long torso that he finds make fitting shirts properly a little more difficult than it should be. 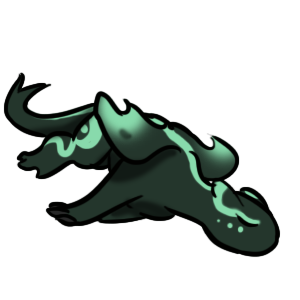 His skin is a light olive shade, and he tends to tan rather than burn, though he prefers the great indoors and so rarely gets much opportunity to tan. He has short, somewhat shaggy black hair that goes in every direction at once without ever really seeming to bother him. His somewhat wide-spaced eyes are a dark hazel, and sit above a broad nose and surprisingly sparse eyebrows given the thickness of his hair. His face is rather square, with a wide jaw and a soft chin. He dresses fairly well, in imitation of those he admires, but in less expensive fabrics, ordinarily in dark colors. This is done less out of any particular love of those colors, but because ink doesn't show nearly as well against dark fabric. He has learned a fondness for the color purple from Raayath though, and usually includes at least one item of that color in his outfit, even if it's only a single bit of embroidery, purple dye being quite expensive. Pet're is a calm, relaxed man who's quick to smile and slow to worry. He doesn't let much bother him, and is less an optimist than he is certain that jumping immediately to panic does nobody any good. He can often be found lounging on the fireheights or on a bench in the dining hall, where he loves to people-watch. He's not especially talkative, preferring to listen, and is occasionally mistaken for a little slow when he takes a few minutes to decide on even the smallest things. When he does speak though, he's generally cheerful, even in the face of impending danger. He's grown to be fonder of people than he once was since Impressing to Raayath. Her infectious cheer is irresistible, and it's hard not to be happy rather than neutral as an onlooker. He finds himself genuinely hoping that those he watches are happy too, and even occasionally initiates conversation when she's around. She's his anchor in life, and he doesn't know what he'd do without her. He's always been jealous of those of the Blood, with their fine clothes and airy manners. He wishes to emulate them in their seeming nonchalance, and thinks that his calm nature makes him seem elegant, though really it doesn't work that way. He longs to be respected in that way, and seeks leadership despite being woefully unqualified for it. On rare occasions, when arguing with someone for any reason (though he has few arguments that last long at all), Pet're can have intrusive thoughts of violence and cruelty. He's calm enough to ride them out and not act on them, but his greatest fear is his own capacity for evil lurking just below the surface. It's not anger; anger wouldn't scare him, anger would be rational, but rather a cold, calculated, calm sort of evil that terrifies him. He fears he sees the same sort of evil in Fort's gold dragons, behind their outward and obvious rage. Petolre was a lucky boy. He had a family who loved him, and many opportunities to thrive. He was always a calm child, more likely to get into trouble for forgetting chores than for getting into fights, and he had several friends among the children of the Hold. He was happy, if a little prone to just wanting to sit in one place all day to watch the world go by. This served him well when the Harpers needed help with scribing. Though never formally apprenticed, he was all too happy to help. He liked the work, the way paper felt when meeting his quill. And it was a way to sort of watch people who had lived long, long before him. He lived uneventfully for many Turns, the war hardly seeming to touch Harper Hall, though the main Hold just a short walk away lost supplies more often. And even that eventually ended, and Thread returned, and the world slipped into a sort of normalcy. Even if the Weyrs were still bickering about politics, it mostly didn't touch the Holds. To Petolre, the Weyrs were just a distant thing that didn't really matter in his day-to-day life, until one day a green came and changed that. The Hatching was only a few days after his arrival, and he'd hardly begun to adjust to life at the Weyr when a stunning garnet hatched and knew exactly what she wanted. And who. Pet're, I'm glad to finally see you. And to actually be able to talk. And... everything, really. I'm your Raayath. Life changed rapidly, in a good way. Raayath grew quickly, even if at first Pet're was a little put off by how strange a color she was. He got over that, and he loved that she was his and wonderful and as interested in figuring things out as he was. Of course, he liked just watching people, and she preferred to try to goad him into taking things apart with his "useful little hands". Weyrlinghood felt all too brief, and they were plunged into the world of Threadfall. They didn't do especially well or poorly, managing to avoid serious injury but also not really distinguishing themselves in any way. But they did their jobs, and that was enough. Raayath was usually more interested in pestering the ground crew about how their flamethrowers worked anyway, and any problems with her own performance were quickly forgotten. Pet're didn't really mind, and let her do most of the talking. Both of them thought they'd fallen into a routine, when Benden decided to attack a clutch of eggs and kidnap a pair of riders, followed by Tuckal's reprisal, and eventually Ista's hostile takeover of the Weyr. But the worst of it was that they realized that Ista had a point. Tuckal's leadership was endangering the Weyr. What Benden had done was obviously objectively worse, but it didn't change the fact that Tuckal had decided that two riders were worth more than the safety of the entire Weyr, and that didn't sit well with Pet're. Raayath was more inclined to sympathize with the Weyrwoman, but still agreed that too little had been done to try to solve things with diplomacy. So when Korinda and Ragaruth left for High Reaches, they followed soon after. The other Weyr had its problems, but at least it wasn't likely to go to war, something neither of them wanted. Of course, not long after the coup happened, and the pair briefly considered fleeing to Semaca, but stuck around long enough to see a return to democracy, and that was enough for them for the time being. A particularly disastrous Threadfall for Moonshot sees the left side of Raayath's face badly scored, blinding her in that eye and damaging her ear membrane badly enough that she can't hear on that side. Worse, the damage to her ear was extensive enough to permanently destroy her sense of balance; she is no longer able to fly. FULL APPEARANCE: Raayath is not the biggest Garnet. Actually, she may be around the middle ground in length, but she is quite short for her length. She has a very narrow and delicate frame, looking fragile but she is remarkably hardy. That said, she will have spurts where it seems like she gets very sick very often, and will lament about it pretty vocally. She is a brilliantly colored baby. Her back, and over her face and down her neck, shoulders, and wingsails, are a brilliant purple. 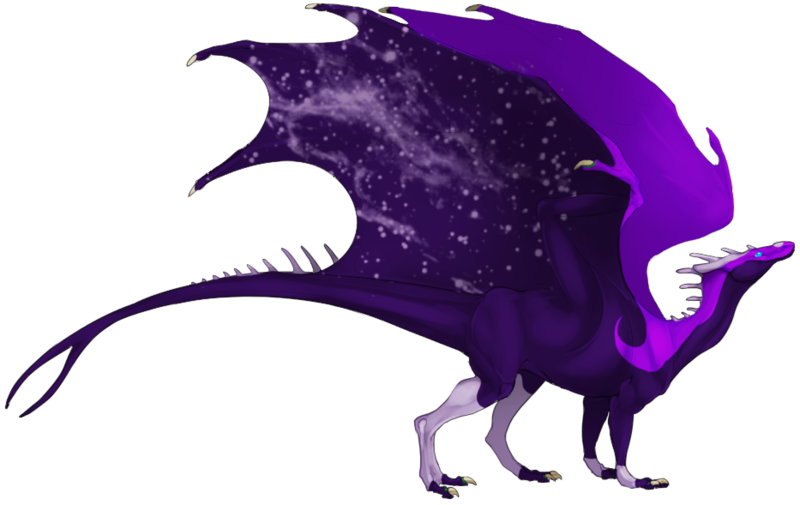 Her undersides are a more royal purple, with lavender markings over her legs and forehead, like she's wearing gloves and boots, and a fancy circlet. There's a lavender dot on her nose. The same color speckles the undersides of her wings like stars and nebulae. Raayath's voice sounds like she is talking through a strange tube, or some weird system. Though her voice is feminine, there's something strange about the pitch, like there is some minor distortion to it. 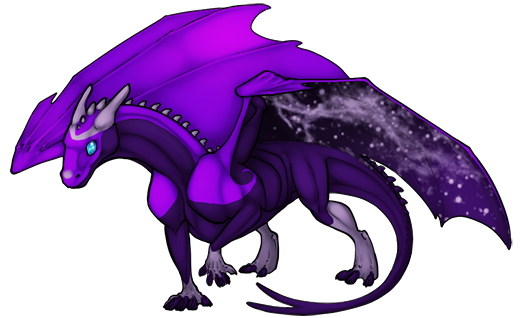 PERSONALITY: Raayath is a friendly dragon, and she is a very intelligent one. She can learn quickly and thoroughly how things work, especially simple machines and anything remotely mechanical. She is a quick thinker, and has a great ability to solve problems. She isn't distant, and is not above asking for help when she knows she is out of her league. She may have her moments of smooth and utter sarcasm, and she's rather quick-witted. She may not be able to hold herself in a head to head physical fight, but she's got the smarm and wit to run circles around others. She can be very insecure, especially around older dragons who know more, and may be not quite eager to speak up if she thinks she'll be ignored. To her human, Raayath is much the same. She's friendly, smart, and smarmy. She's also very protective, and will pick and choose who her family is. She's very keen on having a family, of others she can count on. She wants to contribute, and be a productive member of the Weyr. She hates to feel useless, and she hates to think that she is not pulling her weight. Nothing makes her more upset than to think that she's failed, or that she isn't good enough to be useful.